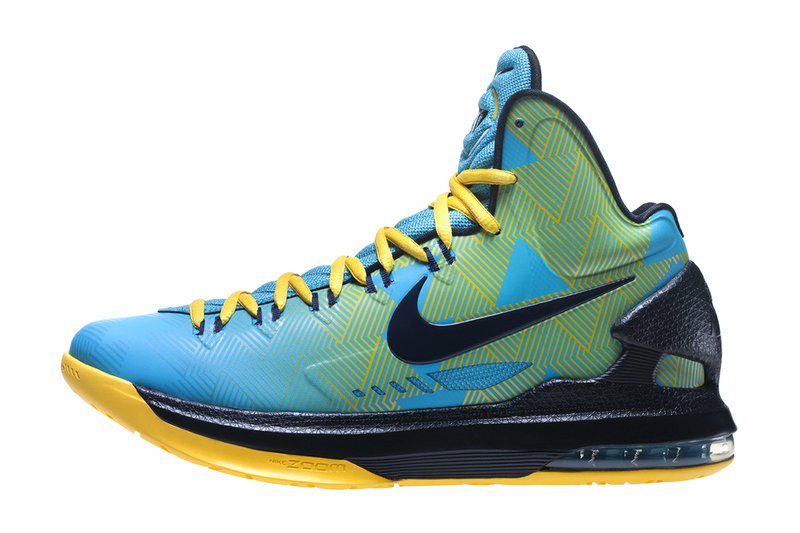 Nike‘s N7 initiative – intended to bring the benefits of sport to the youth of Native American and Aboriginal communities across North America – has once again teamed with Oklahoma City Thunder star Kevin Durant, this time for a special edition of Durant’s signature Leo Chang-designed Nike KD V. Donning a turquoise Hyperfuse upper alongside a bright yellow rubber outsole and navy accents on the likes of the Swoosh, midsole and external heel counter, the kicks see a bold yellow fade print inspired by contemporary Native American art. Capping off the look is the N7 logo on the tongue of the left shoe while Durant’s “KD” logo remains in its usual place on that of the right. Look for the KD V N7 to make its on-court debut this Thursday, April 11 when OKC takes on the Golden State Warriors and expect the kicks to be available at retail beginning this Saturday, April 13.